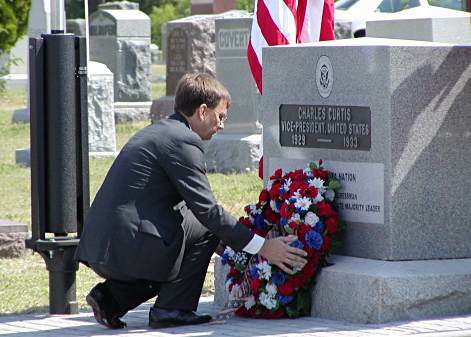 Interested citizens rededicated the restored and enhanced Memorial for Charles Curtis, 31st Vice President of the United States, at 10:30 a.m on Thursday, July 18, 2002 at the Topeka Cemetery, 1601 SE 10th St., Topeka, Kansas. 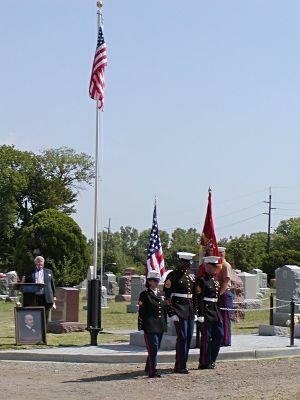 Program: Posting of the Colors/Topeka High School Junior Marine ROTC, Greeting/Neil Firstone, Cemetery Board, Invocation/Gary Mitchell, Prairie Band Potowatomie Nation, Dedication Address/Charles McAtee, Marine Corps League, Remarks/Badger Wahwasuck, Chairman, Prairie Bankd Potawatomie Nation, Flag Raising/US Marine Corps, Placing of Wreath/Mark Yardley, Federal Home Loan Bank, Acknowledgements & Thanks/Neil Firestone, Cemetery Board, Retiring the Colors/Topeka High School Junior Marine ROTC, Benedition/Gary Mitchell, Prairie Band Potowatomie Nation, Open House/at the restored Curtis Home, 1101 S. Topeka Blvd. 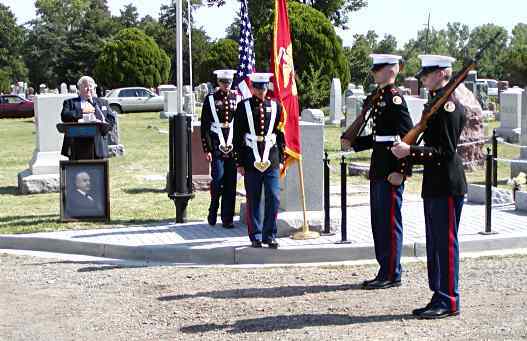 U.S. Marine Corps members and Topeka High School Junior Marine ROTC added pagentry to the event. 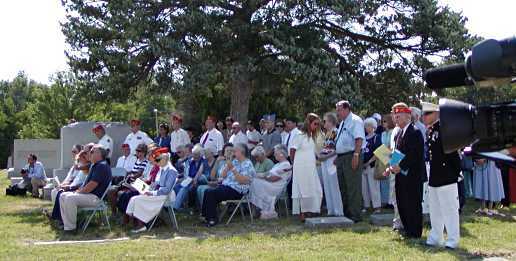 There was a nice crowd present for this event. 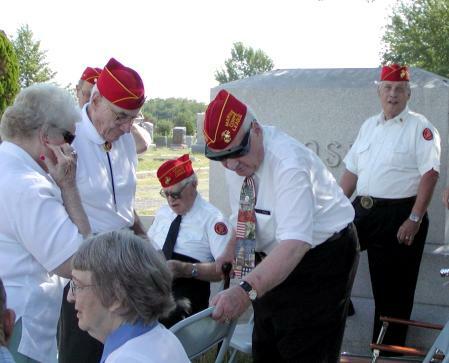 Special guests included relatives of Charles Curtis and members of the Marine Corp League. 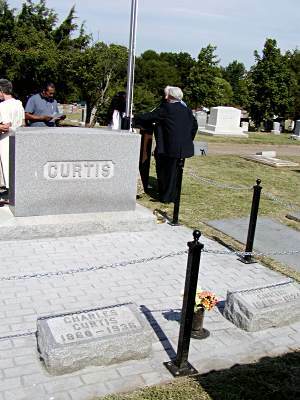 New carving has been added to the Curtis headstone. 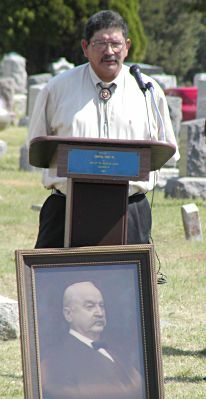 He married Annie Baird of Topeka in 1884. 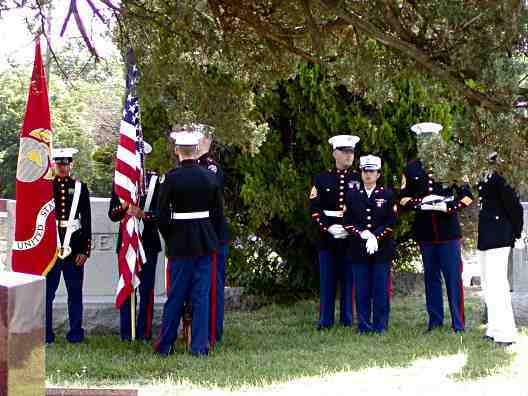 Their three children were Permelia, Harry and Leona. 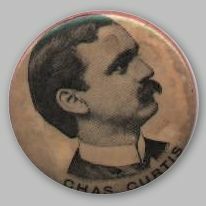 Charles Curtis was born in 1860. 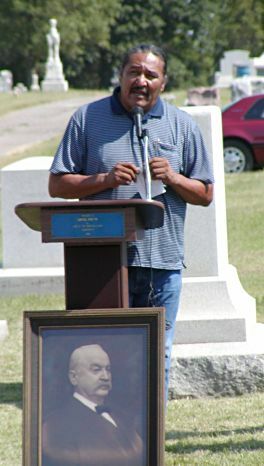 Young Charlie divided his life between two worlds:that of his Kanza grandmother on the Kaw Reserve near Council Grove and that of his father on the dusty streets of North Topeka and the fledgling Kansas capital. 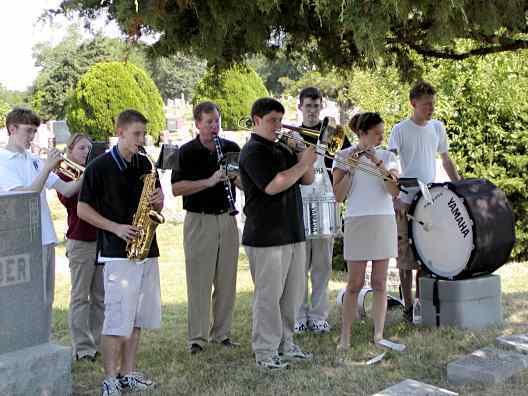 He attended, but did not graduate from, Topeka High School. As a good student he gained the admiration and appreciation of his teachers. He then read law under local attorney Hib Case. 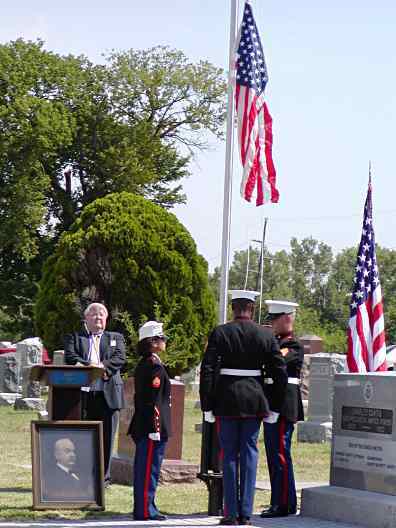 His legal career led to his political career as county attorney for Shawnee County (1884-1888) and state congressman from the 4th (later 1st) District (1893-1907). 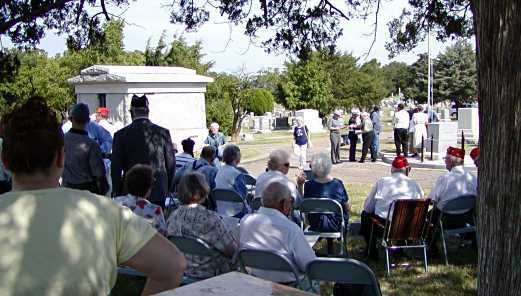 In 1907 he was elected by the Kansas Legislature to the US Senate. Curtis is the only Kansan to serve in the Senate from both the Lane line of succession (1907-13) and the Pomeroy (1915-29). 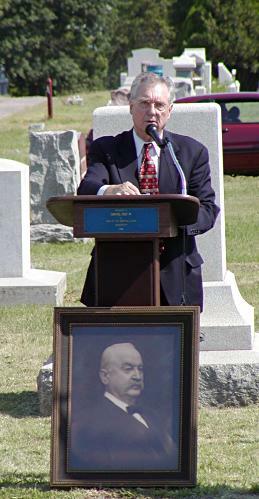 By the end of his Senate career, he was also Majority Leader. 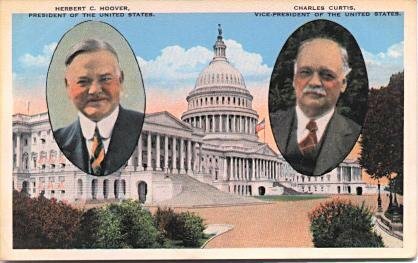 Kansans supported their native son for President in 1924 and 1928, but Curtis settled for second place as vice presidental running mate to Herbert Hoover on the 1928 Republican ticket. 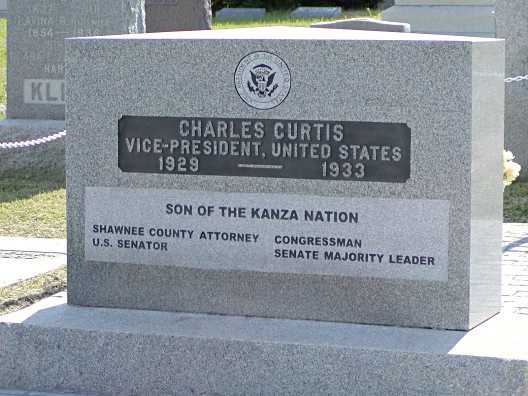 As Vice President of the United States and President of the Senate, Curtis achieved the highest national position for a native Kansan and for a descendant of the Kanza people. Though his duties were few, notable events of his term included addressing the Academy Awards ceremony in Hollywood over radio and formally opening the Los Angeles Olympic Games in 1932. 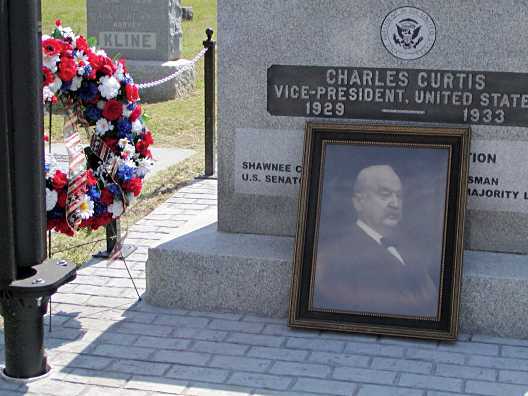 Upon defeat in the 1932 election Curtis retired, remaining in Washington D.C. where he died four years later. The Curtis home in Topeka still stands at 1101 South Topeka Blvd. 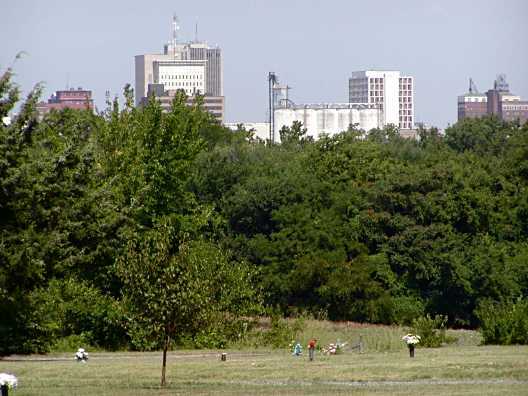 Topeka Cemetery is just southeast of downtown. 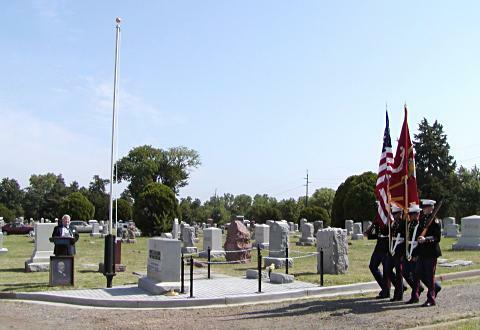 are buried in the Topeka Cemetery. settlement of this area by whites.